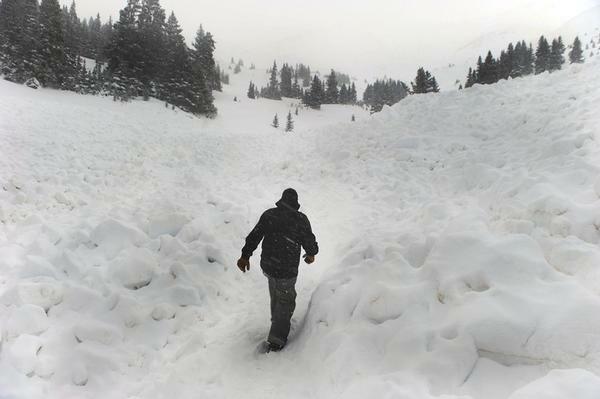 LOVELAND PASS – The five men killed Saturday in Colorado’s deadliest avalanche in 50 years were participants in a backcountry snowboarder event called the Rocky Mountain High Backcountry Bash. Four of the five were expert snowboarders and one was an expert skier. They were representatives and founders of snowsport companies, guides, avalanche experts and veteran backcountry travelers, gathering in the normally safer spring season to celebrate backcountry snowboarding, raise money for the Colorado Avalanche Information Center and test the newest gear. * Chris Peters, 32, from Lakewood. * Joe Timlin, a 32-year-old sales representative with Jones Snowboards from Gypsum and an organizer of the backcountry gathering. * Ryan Novack, 33, of Boulder. * Ian Lamphere, a 36-year-old skier from Crested Butte with an infant and fiance. Lamphere founded the company Gecko Skins, which makes innovative climbing skins. * Rick Gaukel, a 33-year-old American Mountain Guides Association-certified climbing guide with extensive avalanche education from Estes Park. The sole survivor of the avalanche, Jerome Boulay, a sales representative with Silverton’s Venture Snowboards, was dug free by rescuer Mike Bennett, a Dillon resident.